Thais love chatting, laughing, gossiping, maybe not too much discussing but to put it short love to talk to other people. And then it’s no surprise that messenger service apps for phones, tablets or laptops enjoy huge popularity in Thailand. In this post I present you the three most popular messenger apps that almost 100% of Thai people who have a smartphone or iPad have installed and use on a daily basis. The great thing about them all is that they are free. LINE is by far the most popular messenger app in Thailand, yes that’s right much more popular than WhatsApp and Facebook Messenger. Originally from Japan it gained huge popularity within days after its launch in early 2012 and by the end of the year it counted more than 10 million active users in Thailand. Just take a ride in the MRT or BTS in Bangkok and see how 90% of the people that are chatting with friends on their phone are using LINE. The success factor and why it is so popular in Thailand are the “stickers” – a great way to express emotions and Thais just love it and even spend money to always purchase new sets of sticker albums, obviously also to show off. There are even personal profile pages with status update functions they copied from Facebook and Thais use that too. One cool feature of LINE is that you can do free calls as well as voice messages (which becomes more and more popular). To add friends and start chatting in LINE there are two ways: You either search for the Line ID of your friend (which can be found under More – Settings – Profile and the search can be done visa More – Add Friends – Search by ID) and add him as a friend or you scan his or her QR Code (which can be found under More – Add Friends – QR Code – My QR Code). As soon as you have added the person to your friends list you can start chatting. Thai people love social media – did you know that Bangkok is the city that has the highest number of Facebook users in the world? I wouldn’t be surprised if it’s ranked right on top in terms of activity like shared posts and the amount of “like-clicks” as well. The Facebook Messenger is a separate app just to make Facebook messaging more convenient, and the second most popular messenger app in Thailand. What I like about this app is that it shows the profile pictures of the people that have sent you a message in form of small circles right on your home screen so you can decide which one to tap on and read and which one to tap one for longer and drag right into the recycle bin. To add friends on your Facebook Messenger obviously you need to have a Facebook account, add friends there and let them accept. Additionally you need to download the “Facebook Messenger” app. 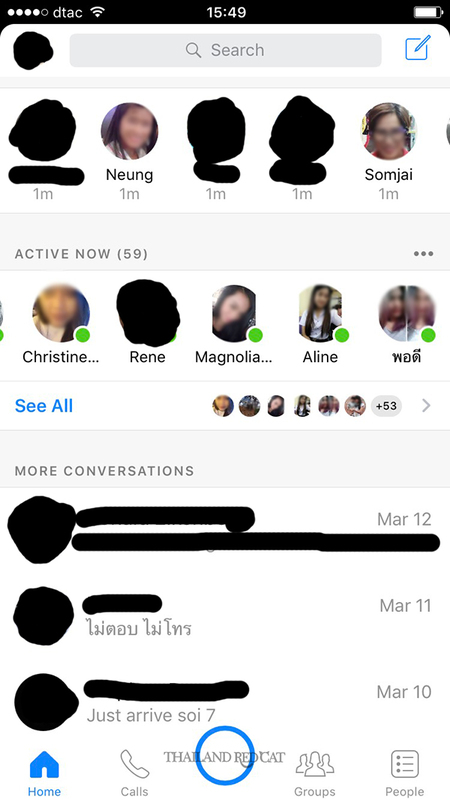 Of course you don’t have to do that and can use the messaging tab in Facebook but I found the separate messenger app more convenient for chatting – and so do Thai people. In most western countries ranked no. 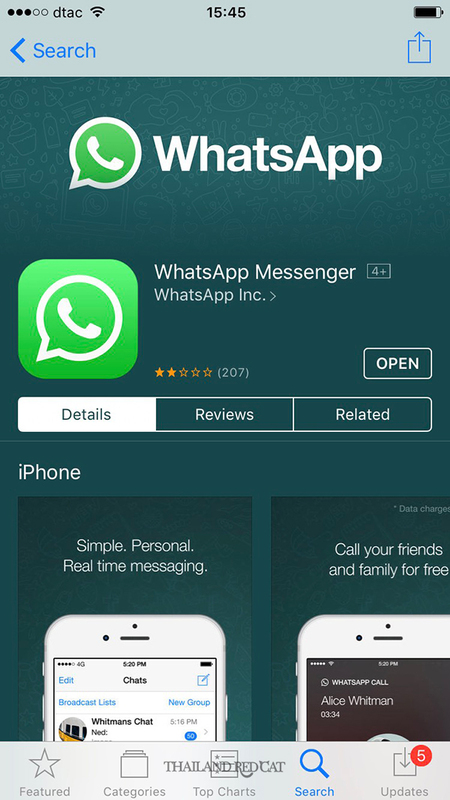 1 on the list of most popular messengers, WhatsApp is only on the 3rd position in Thailand. However, if you take a certain group of the Thai population which are prostitutes and bar girls having Farang boyfriends, then of course she would use WhatsApp to chat with him as he is used to it from home. To add new friends to your WhatsApp messenger and start chatting you simply need to save the phone number of your new friend and after two or three minutes the new contact will appear in the “Contacts” list of your WhatsApp. You can then start the chat simply by clicking at her/his profile in the list. 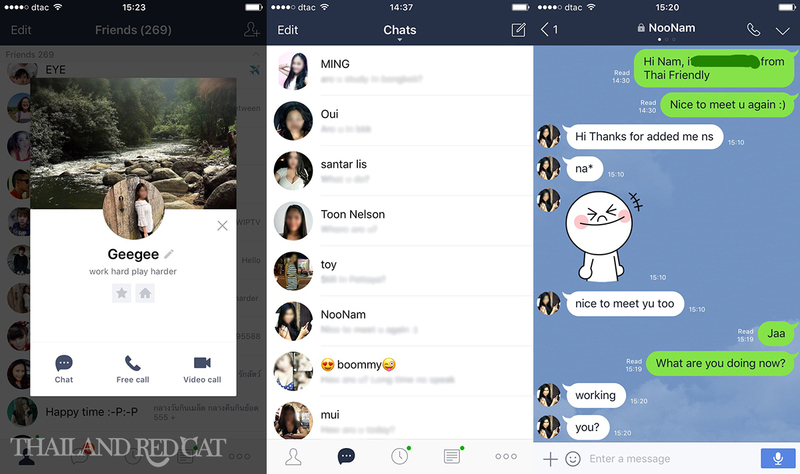 There are a few niche messenger apps (like WeChat, TALK and Chaton) but seriously don’t worry about them, if you have any of the three apps I mentioned here you can chat with any Thai person that has a smartphone. Obviously if you go out to the villages you have lot’s of people that don’t have smartphones or tablets (often not a phone at all) and then the way to write each other is simply via good old sms messages, or email. I make sure to update this post once the apps are not relevant anymore or the Thai people have gotten crazy about another new app from Japan or Korea.